In our series of blog posts with the contents of the 1921 book, A Grammar of Color, we have covered the introductory section by Albert Munsell, and a practical description of the Munsell Color System and how it can be used by T.M. Cleland. The rest of the book is a series of Color Sheets, each page with a fold-out flap, containing 5 sample color combinations separated with slits, so they can be studied separately from the others. An explanation of how this worked was described in the chapter, Suggestions for Use of this Book. For each color sheet, we will display the color sheet description and flaps, along with the text under the flap that accompanies it. There are 18 color sheets in all. In this section of A Grammar of Color, we will cover the description of the three dimensions of color and the first color sheet, Frost Gray, Antique Finish. 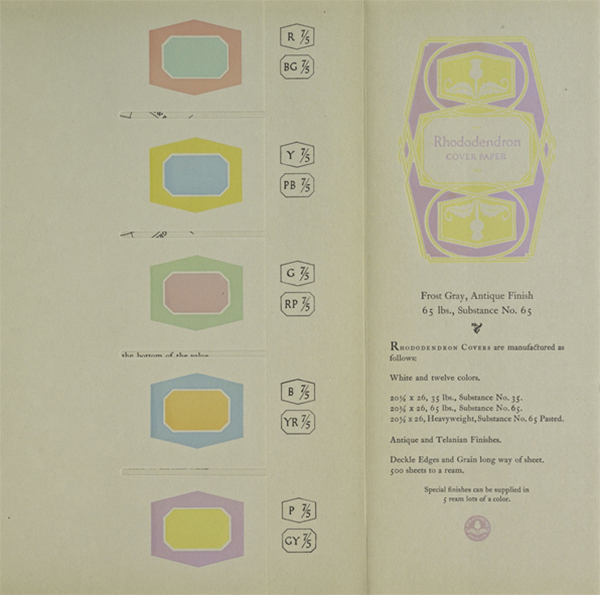 Color Sheet page from the 1921 book, A Grammar of Color, for Rhododendron Covers manufactured in Frost Gray, Antique Finish. Diagram showing purple and green yellow colors in direct opposition from each other in the Munsell Color System hue circle. 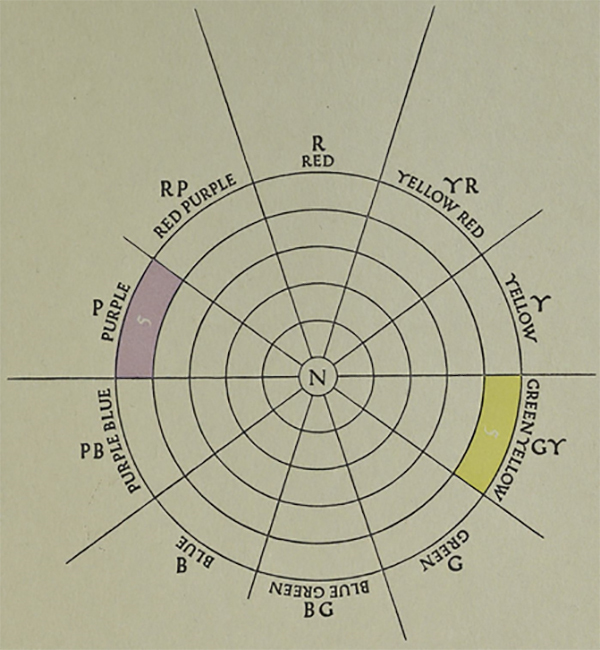 From the 1921 book, A Grammar of Color. 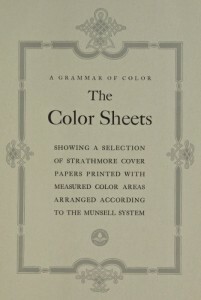 On the flaps of this sheet are printed the ten regular hues of the Munsell System. The outer areas are the five “straight” colors and the inner areas are the five compound colors. They are all high in the dimension of value, being seven steps from the bottom of the value scale. All are of medium chroma, five steps from the neutral pole or center on the scale of chroma. The hues are so arranged that each outer area is the direct opposite or most strongly contrasting hue of its respective inner area. Thus balance or harmony is arrived at in each pair of colors by reason of direct opposition. It is of interest to note that, due to this juxtaposition of directly contrasting hues, each of these colors attains the appearance of a brilliance or chromatic strength greater than it actually registers in the scale of chroma when considered alone. The decorative design is printed in the colors of the bottom flap—P 7/5 and G-Y 7/ 5, the positions of which, in the scales of hue and chroma, are shown on the above diagram. 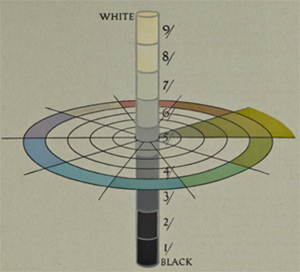 Explanation of the Three Dimensions of Color from the 1921 book, A Grammar of Color. On the flaps are printed the ten regular HUES of the System, all at middle value and middle chroma, as expressed by the term 5/5. The Hue of each outer area is the direct opposite or strongest contrasting Hue of its respective inner area. 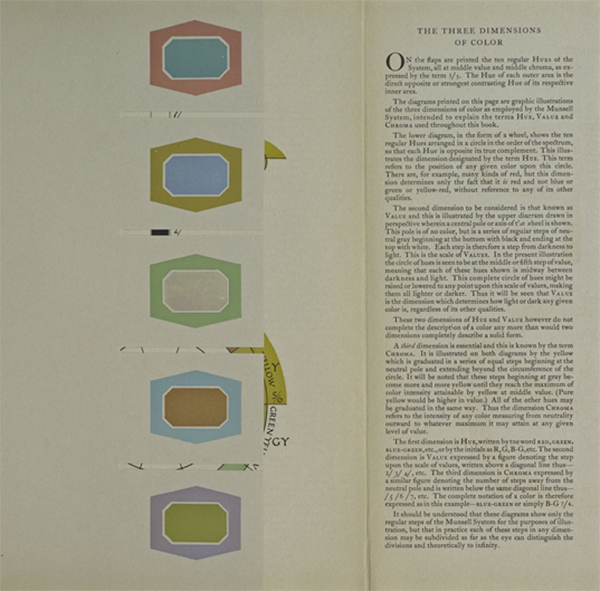 The diagrams printed on this page are graphic illustrations of the three dimensions of color as employed by the Munsell System, intended to explain the terms HUE, VALUE and CHROMA used throughout this book. The lower diagram, in the form of a wheel, shows the ten regular Hues arranged in a circle in the order of the spectrum, so that each Hue is opposite its true complement. This illustrates the dimension designated by the term HUE. This term refers to the position of any given color upon this circle. There are, for example, many kinds of red, but this dimension determines only the fact that it is red and not blue or green or yellow-red, without reference to any of its other qualities. The second dimension to be considered is that known as VALUE and this is illustrated by the upper diagram drawn in perspective wherein a central pole or axis of the wheel is shown. This pole is of no color, but is a series of regular steps of neutral gray beginning at the bottom with black and ending at the top with white. Each step is therefore a step from darkness to light. This is the scale of VALUES. In the present illustration the circle of hues is seen to be at the middle or fifth step of value, meaning that each of these hues shown is midway between darkness and light. This complete circle of hues might be raised or lowered to any point upon this scale of values, making them all lighter or darker. Thus it will be seen that VALUE is the dimension which determines how light or dark any given color is, regardless of its other qualities. Diagram illustrating the three dimensions of color in the Munsell Color System. 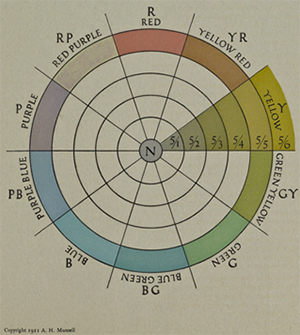 Munsell Color System diagram showing the ten regular Hues arranged in a circle in the order of the spectrum. These two dimensions of HUE and VALUE however do not complete the description of a color any more than would two dimensions completely describe a solid form. A third dimension is essential and this is known by the term CHROMA. It is illustrated on both diagrams by the yellow which is graduated in a series of equal steps beginning at the neutral pole and extending beyond the circumference of the circle. It will be noted that these steps beginning at gray become more and more yellow until they reach the maximum of color intensity attainable by yellow at middle value. (Pure yellow would be higher in value.) All of the other hues may be graduated in the same way. Thus the dimension CHROMA refers to the intensity of any color measuring from neutrality outward to whatever maximum it may attain at any given level of value. The first dimension is HUE, written by the word RED, GREEN, BLUE-GREEN, etc., or by the initials as R, G, B-G, etc. The second dimension is VALUE expressed by a figure denoting the step upon the scale of values, written above a diagonal line thus – 2/ 3/ 4/, etc. The third dimension is CHROMA expressed by a similar figure denoting the number of steps away from the neutral pole and is written below the same diagonal line thus – /5 /6 /7, etc. The complete notation of a color is therefore expressed as in this example – BLUE-GREEN or simply B-G 7/4. It should be understood that these diagrams show only the regular steps of the Munsell System for the purposes of illustration, but that in practice each of these steps in any dimension may be subdivided as far as the eye can distinguish the divisions and theoretically to infinity.